The image on the right shows where Curiosity is heading in next year or two and was discussed in detail in my December 19, 2018 post, Curiosity’s future travels. 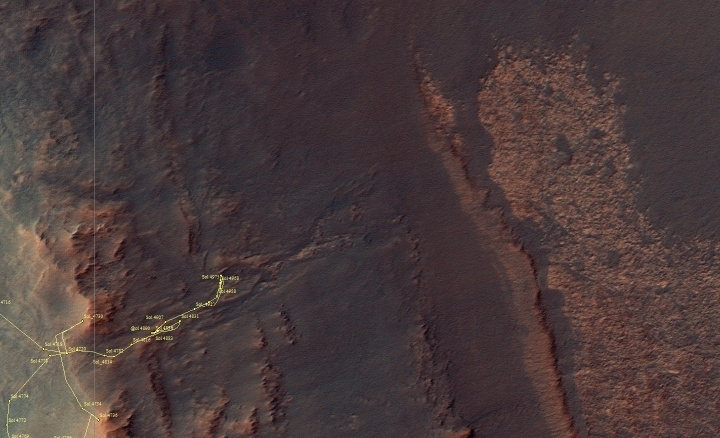 Curiosity’s journey has not yet brought it onto the terrain shown in this image. …The rover is right now just off the left edge of the photograph, on the white ridge dubbed Vera Rubin Ridge visible in the uppermost left. This week it completed the last planned drill sampling on that ridge, and it will soon descend off the ridge and begin heading along the yellow route up the mountain. The white dots along its future route are the locations of recurring slope lines, believed to be seasonal seeps of brine coming from below and causing gentle landslides that darken the surface. As you can see, they hope to get very close to the first seep, and will observe the second from across the canyon from a distance of about 1,200 feet. Before they get to these seeps, however, they will first travel through the darker terrain near the top left of the image, a region they have given the somewhat boring geological name of “the clay unit.” Since they spent more than a year on Vera Rubin Ridge, I would not be surprised they take another year crossing this clay unit, drilling several holes and inspecting its geology closely. Moreover, the terrain will be getting rougher now, so they will have to more carefully pick and choose their future route. 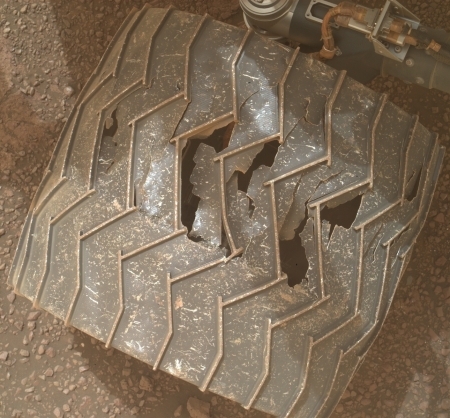 The rover’s wheels over Curiosity’s travels have experienced some wear, as shown in the images in my April 27, 2018 update. This week they did another photo survey of the wheels, which you can see here, here, and here. On the right is one image from that survey, cropped and reduced to post here, showing the most damaged area on one wheel. In my April 27, 2018 update, I was able to identify the same damage seen in a September 2017 image, with little noticeable change, suggesting the wheels were holding up well. This time, however, I was not able to do so, which could either mean I simply missed the match, or that the wheels have sustained more damage since April 2018 and therefore the new damage makes it harder to match it with the old damage. If so, Curiosity faces an increasingly difficult journey. The journey off Vera Rubin Ridge will hopefully begin today. Stay tuned! For the context of Opportunity’s travels along the rim of Endeavour Crater, see my May 15, 2017 rover update. 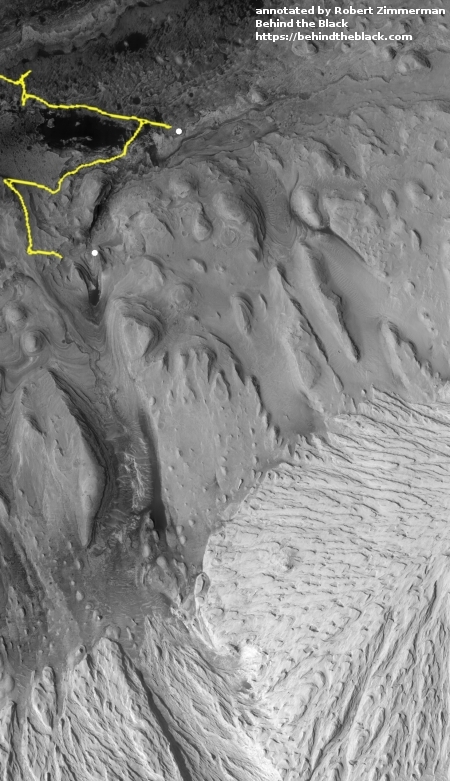 The traverse map above, showing Opportunity’s location halfway down the rim of Endeavour Crater inside Perserverance Valley, was released on February 15, 2018. Through June, Opportunity stayed at this general location as it did contact science. In June Mars was hit by a global dust storm, and since then all contact with Opportunity has been lost. The rover team has been making repeated attempts daily to re-establish contact, with the hope that during the dust devil season in November-January a devil would go by and blow off any dust on the rover’s solar panels, allowing those panels to recharge Opportunity’s batteries. Unfortunately, this apparently did not happen, and the dust devil season is over. Worse, there is evidence that the dust storm activity at Endeavour Crater is once again increasing. This might very well be my last update on Opportunity. I would not be surprised if the next press release from the Opportunity science team is an admission that the rover is lost. This would be a tragedy, but there would be much to celebrate. This was a rover that landed on January 25, 2004 with a planned lifespan of only 90 days. It instead lasted fifteen years, and ended up traveling more than 28 miles. 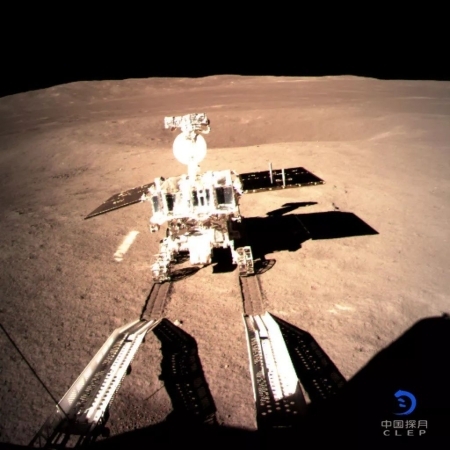 After its successful deployment from the Chang’e-4 lander shortly after the landing on January 2, 2018, the rover has not traveled very far. It completed its plant and biology experiments, and then went into a hibernation mode to take it through the 14-day-long lunar night. Using images from the American Lunar Reconnaissance Orbiter (LRO), the LRO team was able to precisely pinpoint where the lander and rover are located in Von Kármán crater. I expect that in the near future the LRO team will release images showing both the lander and the rover on the surface. How detailed the updates will be from China in the coming months remains unknown. Unlike NASA the Chinese government has no requirement to be open about what they are doing. I expect them to release periodic press releases, but tracking the rover’s travels might be more difficult. Forget about the billions of dollars going out for space exploration..put that money to work right here at home..THERE AINT NO ALIEN LIFE OUT IN SPACE… The true aliens are the illegal immigrants that sneak across the border.